flu | What's Green with Betsy?!? Thieves Oil To The Rescue! After speaking with one of my teacher friends who was frustrated at getting one cold after another from her students despite taking every precaution to keep germs from spreading, including Clorox wipes, I decided to repost my entry about Thieves Oil, an amazing non-toxic germ-killing spray! It is that time of year! 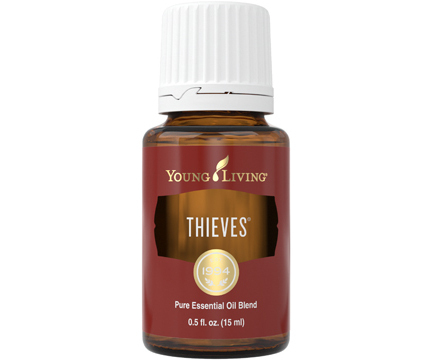 Thieves Oil is a powerful blend of germ-killing essential oils – clove, lemon, cinnamon bark, eucalyptus and rosemary – that help eliminate airborne bacteria and boost the immune system. Research conducted at Weber State University, as well as other documented research, shows that most viruses, fungi, and bacteria cannot live in the presence of many essential oils. When bacteria cultures were sprayed in an enclosed area, Thieves Oil had a 99.96% success rate against airborne bacteria. The name comes from the legend of four thieves who were captured and charged with robbing dead and dying victims during the bubonic plague, which killed millions of people in Europe and Asia for about 600 years. In exchange for leniency, the magistrate wanted to know how the thieves escaped from contracting the plague. They confessed to rubbing themselves with a special concoction of aromatic herbs, including garlic, cloves and rosemary. Hence, the name Thieves Oil. There are a variety of Thieves® antiseptic products such as household cleaners, soaps, hand sanitizers, toothpaste, and mouthwash. All are formulated from the essential oils mentioned in the legend that help fight against bacteria, fungi and viruses and ward off disease. As germs become more virulent and antibiotic resistant, it’s more important than ever to support your immune system and ward off bugs, and anything is worth a try! Do so with Thieves® products, especially during cold and flu season. Keep some in your natural medicine cabinet, at your office, in your car, and at school. I use it, my kids use it, and I can tell you it works. And the spray smells great……. One of my readers sent me a write-up about the secret of frozen lemons. Rather than just using the lemon juice and wasting the rest of this nutrient-rich fruit, freeze it. Wash it first and once frozen, grate the unpeeled lemon and add it to salads, soups, stews, ice cream, cookie dough, chicken and fish dishes, rice, martinis, whatever, for much added nutrition and taste. What a great idea! 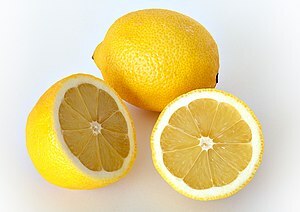 Lemons contain more potassium than apples or grapes. Lemons help restore balance to the body’s pH even though they are acidic. Lemons help detoxify the liver and improve regularity. A large glass of water with fresh lemon juice is an important way to start the day. The lemon peel contains the potent phytonutrient tangeretin, which has been proven to be effective for brain disorders like Parkinson’s disease. Lemons have powerful antibacterial properties; experiments have found the juice of lemons destroy the bacteria of malaria, cholera, diphtheria, typhoid and other deadly diseases. They can also destroy intestinal worms. The Vitamin P (bioflavonoid) in lemons strengthens blood vessels and is useful in treating high blood pressure. Lemons contain 22 anti-cancer compounds, including naturally occurring limonene, which studies have shown slows or halts the growth of cancer tumors in animals. As we make our way through what is being reported as a severe cold and flu season, throw a couple of lemons into the freezer and “grate” your way to good health! Information compiled from www.care2.com and http://www.nutrition-and-you.com. On Christmas Eve, my husband came down with a violent, highly contagious stomach bug, which of course ruined his holiday eating. My daughter succumbed to it the next day and was even sicker. Fearing it would spread to the rest of us, I sprayed Thieves Oil around the house. “What on earth is Thieves Oil and where did you find that?” my husband asked. Having grown up with my “weird” remedies, my son piped up in his no nonsense way, “She didn’t. It just finds her.” And I’m glad it did. The name comes from the legend of four thieves who were captured and charged with robbing dead and dying victims during the bubonic plague, which killed so many people in Europe for about 600 years, peaking around 1300. In exchange for leniency, the magistrate wanted to know how the thieves escaped from contracting the plague. They confessed to rubbing themselves with a special concoction of aromatic herbs, including garlic, cloves and rosemary. Hence, the name Thieves Oil. There are a variety of Thieves® antiseptic products such as household cleaners, soaps, hand sanitizers, toothpaste, and mouthwash, formulated from the essential oils mentioned in the legend, that help fight against bacteria, fungi and viruses and ward off disease. With more virulent and antibiotic resistant germs around, consider adding Thieves® products to your natural, wellness medicine cabinet, especially during cold and flu season. I can’t say for sure whether it was the Thieves Oil or not that kept my son and me from getting the bug, but whatever the reason, it certainly didn’t hurt to spray this sweet smelling, non-toxic antiseptic around the house.